Maa Kalaratri is the seventh Shakti of Maa Durga. The seventh day of Navratri pooja is dedicated to Durga Kalratri. This is the most violent form of Godess Durga. Kalaratri is the one of the fiercest forms of Durga and her appearance itself evokes fear. This form of Goddess is believed to be the destroyer of all demon entities. Kalaratri means the One who is “the Death of Kaal”. Here Kaal is dedicated as time & death. Kalaratri is the one who destroys ignorance and removes darkness. This form primarily depicts that life also has dark side – the violent Mother Nature and creates havoc and removes all dirt. She is also known as Shubhankari.In this form Goddess Kalratri killed Raktabeej. Raktabeej was a demon who could multiply from every drop of his blood which fell on the ground. The Goddess Kaalratri killed him by licking the blood before it could reach the ground and hence conquered him. She endows her devotees with calm and courage. The complexion of Maa Kalaratri is like dark night with bountiful hair and has four hands. The left two hands holds a cleaver and a torch, and the right two are in the mudras of “giving” and “protecting”. She has necklace is so shining like thunder. She has three eyes which emanate rays like lightning. Flames appear through her nostrils when she inhales or exhales air. Her mount is donkey. Blue,Red, White color should be used to wear on this day. 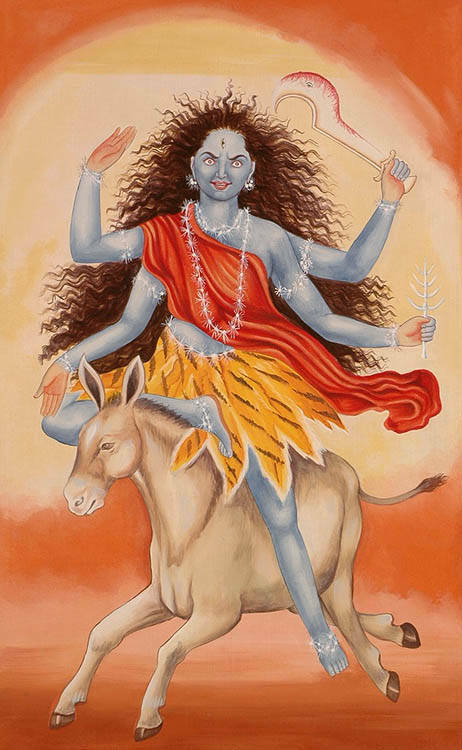 Appearance of Maa Kalratri is very dangerous. But she always gives good fruits. So devoters should not get afraid of her. Her worship on 7th day of Navratri has very much importavnce to yogies & sadhak. Yogis & sadhaks penance on Shahtra Chakra on this day. For the worshipers on this day door opens of every siddhi in universe. Just by remembering Maa ghost ran away. If any negative effect is arising due to a planets than by worshiping on this day bad effects vanishes. Any type of fear goes away. Subhankari Mata always give ‘Subh’ good fruits. True faith restraint & concentration is necessary for worship.